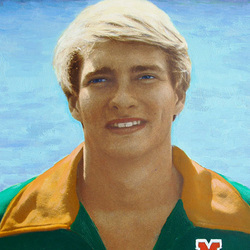 Matt Gribble was a three-time All-American swimmer for the University of Miami from 1980 to 1984. For over a year, Gribble held the world record in the 100-meter butterfly, at one point owning six of the top ten times ever recorded for that distance. He was a member of the United States Olympic team in 1980 that boycotted the Moscow games and did compete in the 1984 games held in Los Angeles. A high school phenom, he competed in the U.S. nationals his senior year at Palmetto (Miami) High School. Gribble captured his first two NCAA individual championships his sophmore season at UM. A winner of three gold medals at the 1983 Pan American Games, he was a member of the 4x100-meter relay team that captured the gold with a world breaking time of 3:40.42. He held school records in the 100-meter and 200-meter freestyle as well as the 100-meter and 200-meter butterfly during his stellar career at Miami.